Compliant systems can be used in fixtures for laser material processing to compensate for tolerances of the components and positioning inaccuracies of the laser beam guiding robot. Compliant systems are devices that compensate for positional error between the joining partners by deflecting in defined directions due to the contact forces during assembly [SCHU 89, 3]. In laser material processing, they can be used for achieving relative Position between the focus point of the laser beam and the workpieces. Synonymously, the term tolerance compensation mechanism can be used, which strictly speaking describes only the use of mechanical principles of action. A mechanism for passive tolerance compensation is, for example, the RCC system (remote center compliance), which can compensate for limited position errors along a certain plane and angle differences around a defined center of rotation by mechanical elements made of spring steel or elastomers [HESS 92,48]. Complinant jigs and fixtures have at least one non-definded degree of freedom. They do not kinematically constrain the workpiece and are therefore not identical to elastic clamping devices, which clamp workpieces kinematically by constraining all 6 degrees of freedom of the body to be clamped. 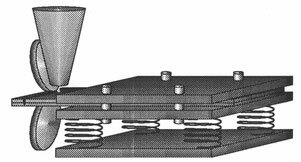 Only fixtures that apply a constant force independent of the actual deflection during clamping are typically classified as compliant, although any fixture may be described as being elastic in the broadest sense due to the springback [SCHR 69,63]. For elastic deflection only a comparatively small force is required, which is preferably generated by a mechanical spring, compressed air, vacuum, oil pressure or magnetic forces. Compliant systems are a subgroup of tolerance compensation systems, which also include sensor-controlled systems, such as the remote axis admittance (RAA) system, which is a remotely controlled axis compensation system. Strictly speaking, such actuators, sensors, and controls are not classified as compliant systems [MILB 94,22]. 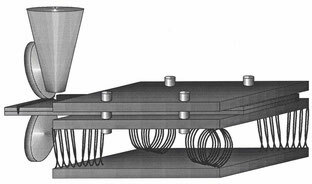 High-attenuation wire-rope springs may be attached as a compliance element under the tensioner or between the tensioner and the components. In order to damp vibrations of the tensioning device or the robot, the use of shock absorbers filled with high-viscosity elastomers is recommended. The practical suitability and cost-effectiveness of these concepts should be investigated and compared with using sensors insert or intalling the elastic element in the wrist of the robot. System-related disturbances depend on the type and condition of the machining system used and are caused by the following errors: Tool errors in laser material processing are primarily errors in the blasting tool, which can be caused by deviations in beam generation or beam guidance. Manufacturing-related errors on machine parts lead to machine inaccuracy. Control errors, machine-internal measuring system errors and jigs failures will still occur. Process-related disturbances are caused by the static and dynamic forces and moments of the process and the process control system, by the process heat and by the wear on the machine parts. System-independent disturbances influence the manufacturing system from the outside. In particular environmental influences - for example vibrations or fluctuating ambient temperatures -, workpiece errors as well as incorrect coordinates in the program are the cause for this. The disturbance variables can be measured directly via sensors or indirectly detected by the measurement of output variables in order to initiate compensatory measures. Alternatively, the error compensation can be done passively in many cases, i.e. by compliant systems, when the effect of the disturbance ist used for its compensation. This eliminates the need for explicit disturbance detection or disturbance effect detection [DIEP 89,12]. The introduction of compliant systems leads to a compensation of the tolerances: Position and angle deviations are compensated by passive compliance. The tolerance chain consists of the sum of the position deviations of the joining partners, the workpiece tolerances (shape and position tolerances) and the position errors of the mounting system, which are influenced by repeatability, positioning accuracy and path deviation of the robot as well as the clamping accuracy [LEIS 89,9]. In order to ensure cost-effectiveness and process reliability in factory automation, controllable and simple resources should be used. Compliant systems fulfill this task because they make it possible to compensate easily for tolerances and simplify complex motion sequences [MILB 94, 26]. In order to achieve homogeneous welds with good quality, the path energy must be kept constant during the machining process. This requires compensating movements of the beam guiding robot in the area of narrow radii, which often exceed its kinematic and dynamic capabilities. The simultaneous movement of the laser beam and the workpiece could reduce the complexity of the robot movement and possibly increase the machining speed by compensating positioning errors of the robot due to the workpiece movement. Compliant systems can increase the tolerance range, in which the robot path must run [MILB 94,28]. This brings significant advantages in Robot programming: In order to use the laser material processing systems with CAD/CAM coupling in a time-optimized manner, offline programming is often used instead of a time-consuming teaching process. However, offline programming is often not possible without sensor-based correction of the path errors of the robot and the geometry and position deviations of the workpiece [GARN 92,32]. Compliant systems can reduce or avoid the high investment costs for sensor technology. Due to the required accessibility, the reduction in NC axes that is possible due to compliance plays only a minor role in 3D laser material processing so far. The trend is rather towards a seventh axis on articluated arm robots, either to move them on a linear track or to simplify the movement of a roller or cutting of holes with an additional rotary axis in the wrist. Compliant jigs are, so far, rarely used in laser material processing. Due to their principal advantages, there is a significant need for research here. 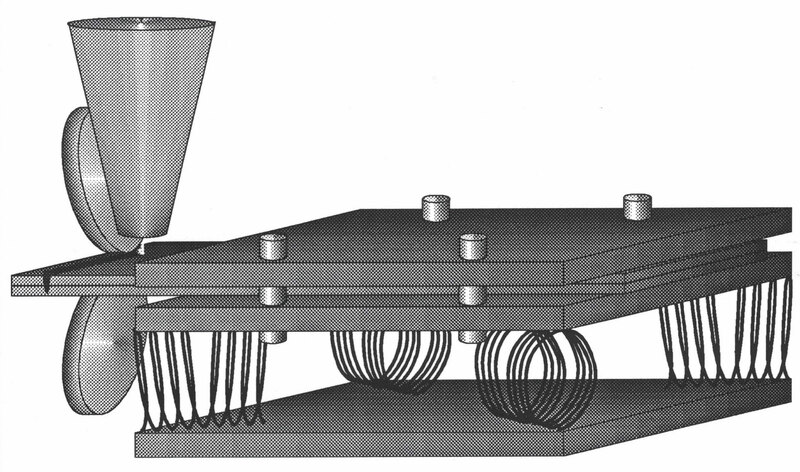 The resilient clamping device can take on two tasks: first, it can ensure the exact positioning of the components with each other by defined gap thicknesses are generated by the clamping force, on the other hand, it can be used for the relative positioning of the components with respect to the laser beam. 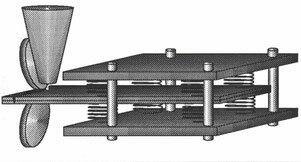 In the concecpt on the left hand side, the compliance is installed between the table and the fixture, by which the position of the workpieces is defined against each other. The disadvantage of this principle is that comparatively large inertial forces arise during acceleration of the mass of the device. In the concecpt on the right hand side, the compliance lies between the device and the workpieces. This is preferable in the case of large workpieces, because the size of the fixture would result in a large inertia. However, the clamping forces between the components are here only generated by the relatively small elastic forces of the compliance elements. The size of these forces is limited because they must be transmitted to the robot via the pressure rollers. 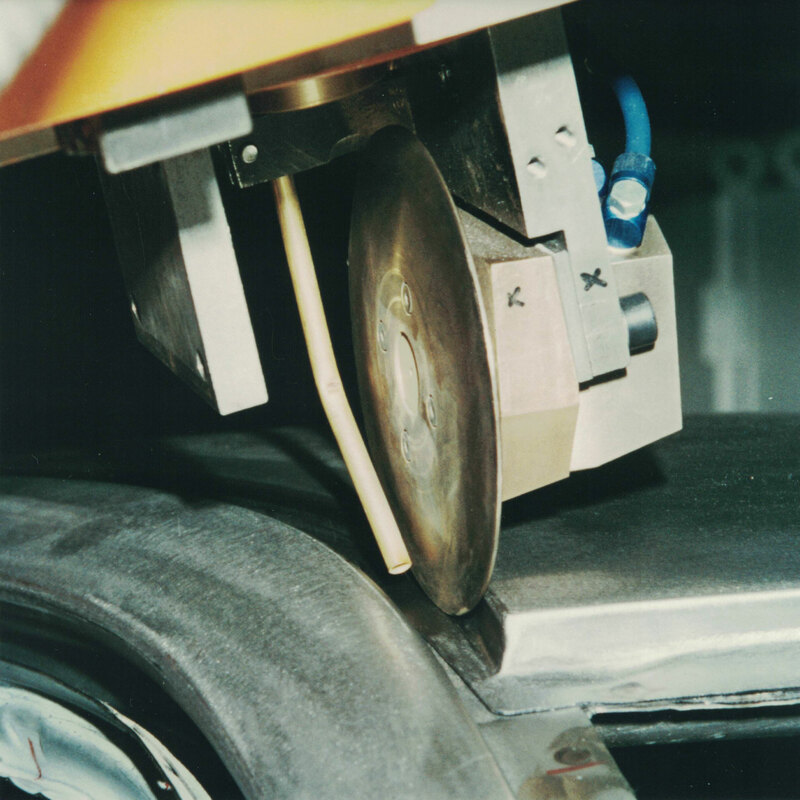 Therefore, in this case, a pinch roller is expected to be indispensable to achieve defined weld gap thicknesses. 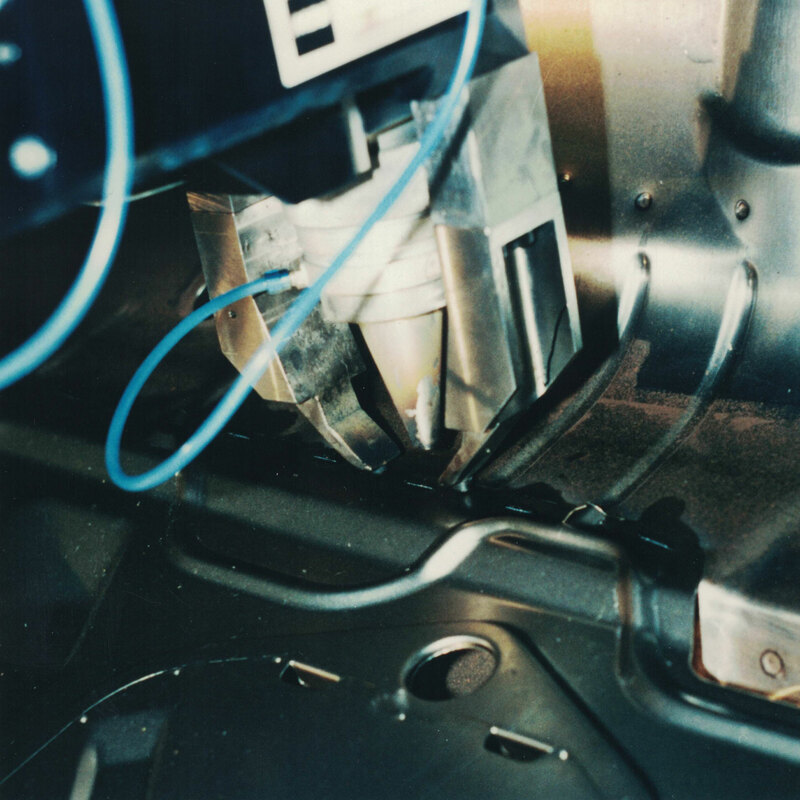 In both cases, the laser welding head runs along a rigidly guided path and presses the workpieces into the optimum position via the upper pressure roller. By means of the lower clamping roller, the workpieces can be pressed against each another locally, and the robot can pull the workpieces upwards. In order to process different sheet thicknesses and to compensate for the relative position of the sheets, the rollers must also be mutually displaceable, that is, the lower roll must be spring loaded. ITT Enidine Inc. in New York offers wire rope springs or isolators. They are comparatively small and allow deformation in several directions. Because they are made of stainless steel, they are characterized by corrosion resistance, freedom from maintenance and high temperature insensitivity. 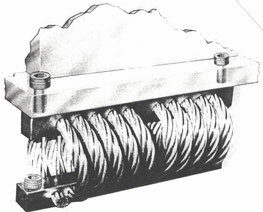 While with conventional wire rope springs, the cables are clamped by a frictional connection between two aluminum bars, these are attached by a temperature-stable casting in a square bar tube. Wire rope insulators can be used in the design of compliant mechanisms. They often have different spring characteristics depending on the loading direction. Thus, the greatest compliance can for instance be achieved in the horizontal plane. They have a 40% higher spring stiffness in the vertical direction than by shear and twisting in the horizontal direction. Jarret offers rotary buffers, in which a highly viscous elastomer (white in the picture) is pressed through a gap between the rotor and the stator. These buffers serve exclusively for damping because no restoring moments are generated. The righting Moment must therefore be generated by a torsion bar or, as shown here, by gravity [JARR 92,8]. [BKLT 93] Produkt brochures of BKLT Lasersystemtechnik GmbH, Rennbahnstraße 3, 83043 Bad Aibling, Germany, 1993. [DIEP 89] The van Diep: 'Ein Beitrag zur Kompensation von geometrischen Fehlern in flexibel automatisierten Fertigungssystemen.' Hanser Verlag, München, 1998. [ENID 93] Enidine GmbH: 'Industrie-Stoßdämpfer - Produktübersicht und Auswahl.' Enidine GmbH, Rheinauenstraße 5, 79415 Bad Bellingen, Germany, 1993. [GARN 92] Florian Garnich: 'Bei Laser-Licht betrachtet - Schweißen und Schneiden mit Laserrobotern.' Roboter, Oktober 1992, S.32-34. [JARR92] Jarret, Puffer und Federtechnik GmbH: 'Puffer und Federn - Anwendungen der hydrostatischen Kompression von Elastomeren.' Jarret, Feldstraße 36a, 46149 Oberhausen, Germany, c.a. 1992. [LEIS 89] Ludwig M. Leiseder: 'Prismatische Spanntechnik.' Verlag Moderne Industrie, Landsberg, 1989. [MILB 94] Joachim Milberg: 'Kompliente Systeme in der Montage.' Final Report on the DFG MI 234/22-2 project. [SCHR 69] Karl Schreyer: 'Werkstückspanner (Vorrichtungen).' Springer, Berlin, 1969. [SCHU 89] Reinhard Schugmann: 'Entwicklung und Auslegung nachgiebiger Werkzeugaufhängungen für die automatische Montage.' Dissertation, TUM iwb, München 1989.